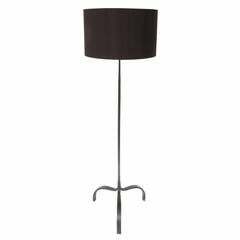 An Italian floor lamp with a very architectural base in black iron and opaline glass shade. The light itself has four sockets for bulbs along the black iron base inside of the long rectangular opaline glass shade. Unknown designer. Brass details. 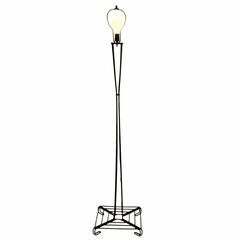 Interesting waisted form floor lamp constructed of bent iron rods. Black paint finish over iron rod frame, working, original condition, no shade included. Floor Lamp, Italy, 1950s. 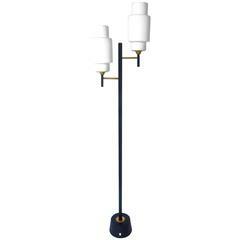 This lamp has five swiveling brass arms, opaline glass shades and the iron frame is lacquered black. Feel free to contact us for more detailed pictures. 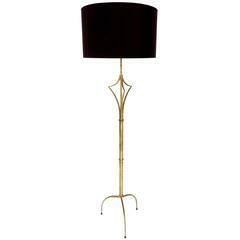 Murano floor lamp with opaline glass color and details in gold flakes.